Where in the world is Jim Nicosia? Jim Nicosia is a regular participant at the New Jersey Council of Teachers of English conferences at Montclair State University and the College of St. Elizabeth. Check out www.NJCTE.com for further information. World-class authors frequently speak there, and it's something you wouldn't want to miss. 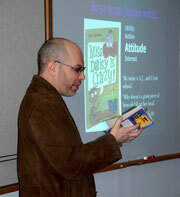 His latest presentation was April 1 at Montclair, where he introduced world-class authors A. S. King and Andrew Smith at the annual NJCTE conference. Throughout the year, Jim speaks on children's literacy at several venues, including the NJCTE, the Society for the Study of American Women Writers National Conference, and at the National Conference for the National Council of Teachers of English (NCTE)/Assembly on Literature for Adolescents (ALAN). He has written and presented papers on Jon Scieszka, Jim Benton's Franny K. Stein, Lauren Child's Clarice Bean, and Megan McDonald's Judy Moody, among others. Jim Nicosia will be presenting with Laura Nicosia at the Clifton, NJ, Barnes & Noble on "Are There Boy Books and Girl Books?" No spoilers here for the answer. The event is free, so join them Thursday night, October 12, on Route 3 in Clifton.